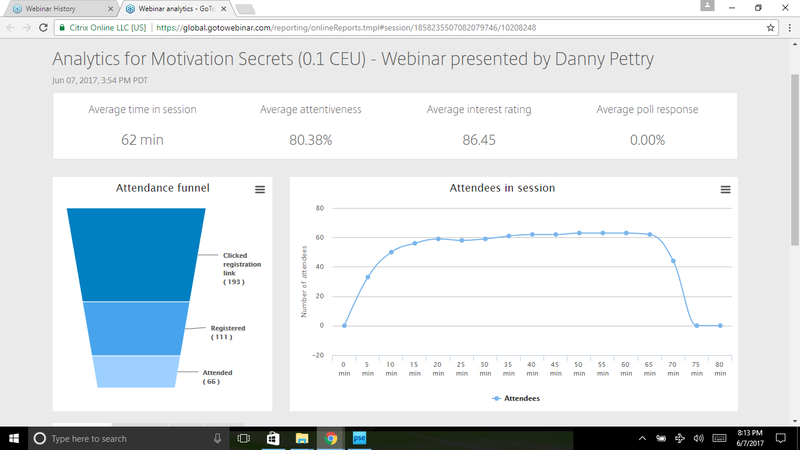 I provided a free training tonight (June 7, 2017) on motivation secrets for (0.1 CEU). Avg time for session was 62 minutes – so we met the one clock hour. A total of 193 people clicked on the registration page. We had 111 people register for the training and a total of 66 live attendees! I’m pleased with that. Of course we had 101 attendees in our training on advanced certification. I’m happy with those results and hope to reach at least a 90% next time. I should have included a question in the evaluation on how to be more interesting.